The US stock market continues to shrug off challenges to its bull market run. Despite the drama in Greece and severe gyrations in Chinese stock markets, US stocks have now recovered fully from their correction in June and returned to levels at or above their all-time highs. Investors still have reasonable grounds to expect further appreciation in equities, though at current prices, the risks have risen and the potential rewards are lower. In Greece, the outlines of a deal are in place. Greece will receive sufficient funds to re-open its banks and pay off near-term debt maturities, provided the government applies more fiscal austerity and adopts further labor market, pension and tax reforms. Though not part of the agreed deal, debt restructuring is now on the table, as the IMF has agreed with Prime Minister Tsipras that significant debt relief is required. Stock markets in both Europe and the US cheered the deal, despite near-unanimity that Greece cannot achieve the fiscal targets to which it has agreed. IN GREECE, THE OUTLINES OF A DEAL ARE IN PLACE. In China, a sudden 30% correction in stock prices coincided with the Greek drama. The government took extraordinary measures to stanch the decline, including halting trading in half the companies on the Shanghai stock exchange, banning the sale of shares by controlling shareholders for six months, halting new share issuance, and lending $50 billion or so to brokerage houses to purchase stocks. The moves seem to have worked, though trading is still halted on many stocks. The question is whether there will be significant economic fallout from the Chinese share price decline. 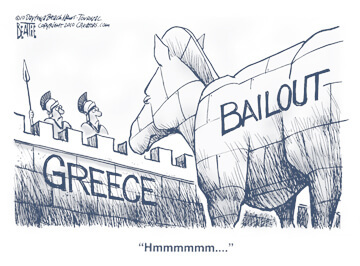 In the aggregate, about $2.5 trillion in market value was erased, equal to about ten times the national output of Greece. However, the Shanghai index is still up 25% year-to-date and 98% in the past year. Furthermore, the gains were made so quickly that perhaps not much had been cashed out for consumption. With the Greek crisis put off for another day and China’s turmoil eased, investor attention can return to more fundamental determinants of the market’s destiny: corporate profits and valuation. The bull market since 2009 has been fueled by two factors: substantial growth in corporate earnings and a higher valuation of those earnings by investors. What is the outlook for these factors? The chart below shows the price of the S&P 500 stock index and earnings of its constituent companies. Since the market bottom in March 2009, the price of the index has tripled, rising from about $700 to $2,100. Earnings, meanwhile, have slightly more than doubled, from $50 to $115. Both the index price and its earnings are now at (or very near) record highs. The steep decline in oil prices and the rise in value of the US dollar have temporarily brought earnings growth to a halt. In the past several quarters, earnings in the oil patch have fallen by 50% or more. Sectors exposed to the strong dollar, such as consumer staples and industrials, have seen earnings growth slow significantly. As a result, full year earnings may grow only 2% or so this year, if that—well below the rate of the past several years. However, absent a repeat of the oil price decline and dollar strength, analysts expect earnings to grow as much as 12% in 2016. Since early estimates are usually optimistic, it may be more reasonable to expect earnings to grow of 6-7%, in line with long-term averages. A quick rebound to this level of earnings growth would most likely reward investor confidence. More difficult to forecast is the market’s reaction to the Federal Reserve Board’s plan to raise interest rates later this year. Here again, the stock market does not appear to be overly concerned. The Fed has taken great pains to avoid surprising anyone. In the past, stocks have often continued to rise after the first rate hike. On the other hand, interest rates have never risen from a level that was so purposefully engineered to move stock prices higher. And with valuations elevated, the chances are probably higher than the market perceives that rising rates will generate volatility. The impact of high valuations on future returns is illustrated in the chart above. Shown is the 10-year average annual return to equities starting at different levels of valuation. In this chart, the valuation is shown as the ratio of price to the cyclically-adjusted price/earnings ratio (“CAPE”). CAPE averages earnings over the previous 10 years so as to adjust for business cycle. With CAPE now at 23x, history suggests that equity returns over the next ten years will be 5.1% per year. No one can predict where earnings and prices will go. This chart, however, helps put the current investment in an historical perspective.